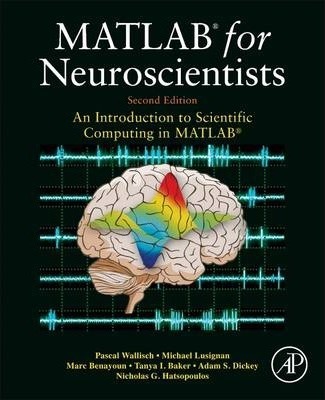 MATLAB for Neuroscientists serves as the only complete study manual and teaching resource for MATLAB, the globally accepted standard for scientific computing, in the neurosciences and psychology. This unique introduction can be used to learn the entire empirical and experimental process (including stimulus generation, experimental control, data collection, data analysis, modeling, and more), and the 2nd Edition continues to ensure that a wide variety of computational problems can be addressed in a single programming environment. This updated edition features additional material on the creation of visual stimuli, advanced psychophysics, analysis of LFP data, choice probabilities, synchrony, and advanced spectral analysis. Users at a variety of levels-advanced undergraduates, beginning graduate students, and researchers looking to modernize their skills-will learn to design and implement their own analytical tools, and gain the fluency required to meet the computational needs of neuroscience practitioners. "...a handy resource for instructors of neuroscience, particularly those interested in more intense data analysis and/or neural modeling."